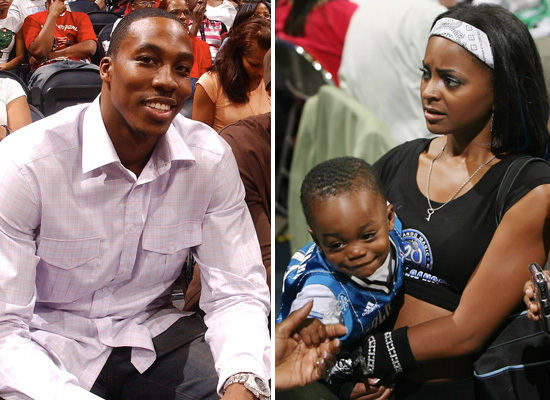 *Dwight Howard is going after a $500,000 judgment won against his baby mama, “Basketball Wives” star Royce Reed, after she violated a court order prohibiting her from talking about him in the press. According to TMZ, Reed has yet to pay up after Howard won the judgment in Florida, so the NBA star has filed papers with a California court, which could give Howard the right to go after Reed’s assets in Cali. Howard claims Reed now owes him $551,606.74 — which includes interest. TMZ says it has sources who claim Reed has zero assets in California. Can’t squeeze blood from a turnip. “test”! Mama’s baby, Poppa’s..”maybe”! Prolly?…haaaaayil naaaaaaw!! But!…you can sho nuff put dat “turnip” in “jail”!, fa breakin tha law/agreement! And huh lil as-s need tah “grow sum moe”, anyway, so “I” say?..”replant” that “turnip”! Dumb Hoe. Good for D Howard. And hey lady! ?, no one BUT “another one” like “her”,would or COULD disagree with you! If you don’t do dirt, there’s nothing for anyone to talk about and you don’t worry if a fool tries to make stuff up! That applies to both women and men. You tell on yourselves people. Exactly. What is he so concerned about her tattling? concerned about her tattling? are you insane? she VIOLATED A COURT ORDER! it’s pretty straightforward. Thank You soooooooo much! WTF do these bitter, “manhate’en” as-ses do, when they “drive their cars”!?? G.D. dey’s blind!! They dig for the “justification” they THINK these FEmales are due?, just as much as the “gold-diggahs”, have these babies & look for cheese! But! ?, don’t EVVA “point out the OBVIOUS truth”! Truly afknmaaaaaazine! Cosign to all the above posts. I seen part of the B-ball wives finale where Royce and the other hoodrats showed their azzes. What exactly does this woman do for a living??? and I do not believe she is married to any NBA player am I correct on this??? Please advise. Dwight — I forgot what she said about you; but you keep reminding me like a dumbass. Now, you look even more petty than she does. You don’t need the money. You shouldn’t even need the satisfaction. Shouldn’t you be focusing on the Magic and doing well in the Playoffs? You are doing more damage to your image and reputation than Royce ever could. You must really still be pissed off that you slept with her. Get over it. So royce boinking Dwight is her claim to fame and why she was featured on the B-ball wives show??? Well, she was a professional dancer for two NBA teams — the Heat and Magic. She is actually a good dancer (although raunchy as hell). But yeah, screwing Dwight and having his baby is pretty much why she’s on that show. Did you say boinking? You sound like my ex. LOL! It’s funny how things change when the shoe is on the other foot. If the situation were reversed the women posting on this subject would be like get your money. Royce did not adhere to the gag order plain and simple so she should pay! And yes Howard is going after her b/c he’s pissed that she took there relationship public and regulates his time with his son. Ahh, that age old gender double standard. Old as-s peeps ‘on here are reeeeally ‘on sum blind/bitter/gender bias B.S.!!! It ain’t about nothing BUT HER AS_S NOT stickin to the agreement SHE agreed to, to get the “gold she dug for”! And the STUpis as-s chick, couldn’t even STFU to GET the fkn check! Adn now?, SUM MOE gold diggahs g’on talk about…”him”!? WTF!?? people! Do yall EVVA hold a FEmale accountable for HER stupid as-s mistakes!!?? Oh yeah, I forgot..”only when she steals yall man”! Fkn twisted & hilaaaaaaaarious denial! O mean, the way “I” see it?, he & ALL the others, are stupid as hell to just give away cheese, b/c they won’t…”put a sock ‘on dey shoe, when they’re kickin it”! But see?, HE can afforrrrrd it! While “her broke as-s”?, knooooows she cain’t afford to open her mouth!, but tha trick diiiiid, aaaaanyway! Truly dumb & STUpid! And no one BUT HUH made HUH do dat shyt! So…let that lil tramp “cash the check” her stupid,big as-s mouth wrote! And BTW?, what kinda skank as-s/FEmale/woman is THAT, to just have a dude’s seed, for some damn…money!?? A LAZY AS_S one, “that’s” what! And any OTHER females, thinkin what she & the others do, ain’t “that bad”?, you’s MUST be “another one”! So much for “strong black queens” & “independence”, huh!? I mean, I KNOW there are some out thurr, but “yall”?…STFU & GTFOH!! Where in this thread do you see anyone giving props to Royce’s behavior? Just take a look at how many have “thumbs down” those who have the AUDACITY! !, to see this shyt, “faily/truthfully”! Then?, you’ll “see”, what the objective people see.